I have to admit, I brake for burgers. So when I saw the sign “Paukus Burgers $1.50” I pulled in. You can barely get a piece of candy for a dollar fifty, a burger seems like a deal. The Paukukalo Store is open again, and back under its original owners, making their “pauku-burgers” that Waiehu folks have been missing for a few years. You can’t miss the spot, their iconic Waiehu Beach Road store went through a few different leases and paint-jobs before the owners decided to re-paint and reopen their own Filipino food and burger store. 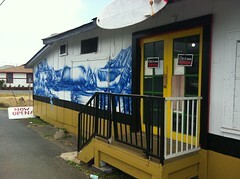 The building has a bright blue island style mural of waves and mountains on it, you can’t miss it. These burgers are no frills, but their is something about them that is irresistible beyond their price. The warm soft white bun, and the seasoned ground beef filling is the equivalent to a Filipino style manapua. The folks at Paukukalo Store hands these steamy sandwiches over all day long from 6am to 4pm monday through Friday and 6 am to 2pm on Saturdays. 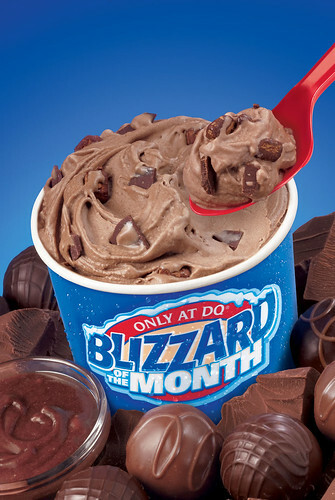 Dairy Queen is celebrating National Ice Cream month with a new Blizzard flavor Triple Chocoholic. This thick ice cream dream treat is truffles, chocolate chunks and dark fudge blended with their signature vanilla soft serve. The DQ also kicks off this promotion with a buy one get one free coupon available by signing up for a being part of the blizzard fan club. I just signed up to see if worked and got my coupon to the Lahaina Cannery Mall DQ. The Blizzard was first served in 1985 and has been a hit ever since. 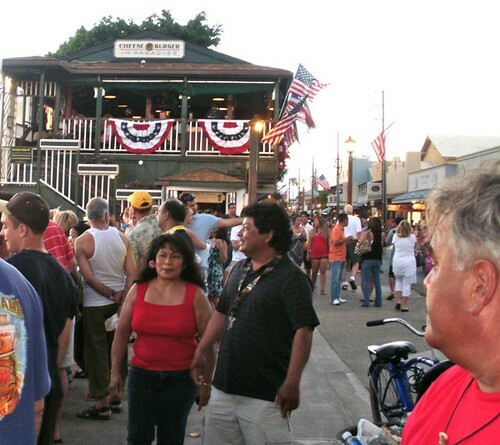 If you want to see fireworks for the Fourth of July you have to head to Lahaina where Front Street closes at 5 pm for the revelry. LahainaTown Action Committee will be hosting a Front Street Food Fair at Campbell Park right between Captain Jack’s and the Wharf and the Baldwin House Museum. Lahaina Canoe Club will be selling chili, rice, hot dogs, and chili dogs, Outrigger Pizza Co will have 10″ pizzas, Shaved Ice by Local Boys Shaved Ice, and Original Aloha Kettle Korn will have kettle corn, fresh coconut, coconut water and lemonade. LAC will have beverages for sale as well. 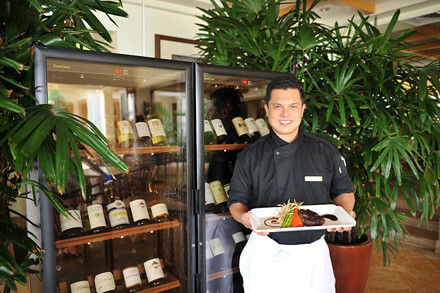 David Paul’s Island Grill will have an early seating three course special for 4th of July, for $39.95. But the real party will be their post firework Backyard Party celebration from 8 to close with $5 fine cocktails, wine and complimentary pupus for $15 per person, and DJ entertainment. The Hyatt Maui has a special treat planned for 4th of July. 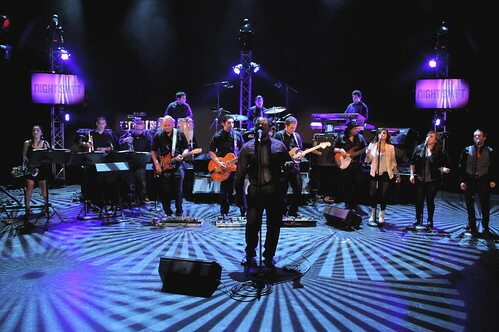 The annual month long live music appearance of Citrus College Performing Arts starts June 30, and their first weekend highlights will be a Red White and Blue Party on July 2nd from 10 pm to 1 am at the Monarchy, and nightly appearances and Japengo (5:30-7:30) and Umalu (4pm -9pm). On the fourth they will have a special show at Umalu starting at 7:30 pm. In Kapalua Fourth of July will be celebrated with a BBQ dinner, hula hoop contest, sack races, balloon toss and live entertainment at Village Cafe and Sweet Shoppe. The menu includes barbecue chicken, kalbi ribs, hamburgers, hot dogs, coleslaw, potato salad and corn on the cob. Fabulous treats from the sweet shoppe will be available all day, as well as and popcorn and ice cream. Tickets are available now for $30 adult and $20 child, and under 5 are free, but prices go up on July 3rd so get them now by calling 665-1122. A portion of the proceeds will go to the Beyond the Rainbow Foundation, a charity for Maui’s youth. Paired dinners dont slow down for the fourth. 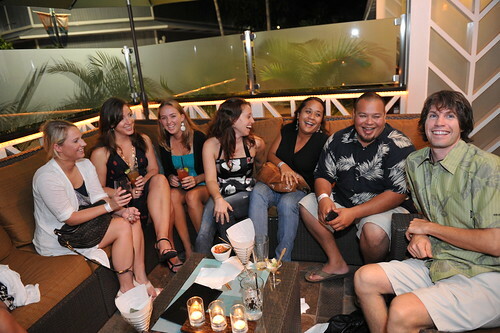 The Grand Wailea will be hosting the July installment of Toast! 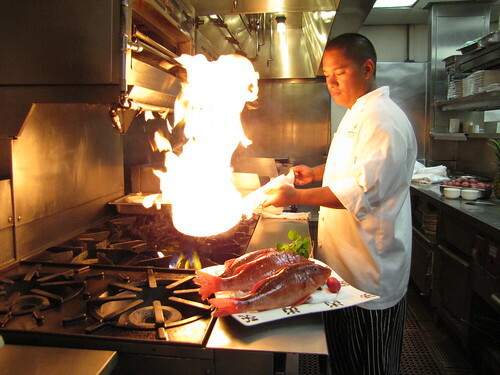 with a sake pairing five course dinner at Humuhumunukunukuapua’a on Friday July 1st. Chef Bancaco gets to play with sake selections by Kikasake-shi Scott Dalton (sake expert to you), his Japanese inspired menu items include negi toro, Kona crab congee, kumamoto oysters, and Kakuni veal cheek. Reception starts at 5:30 and reservations are $100. Canoes Restaurant at the end of Front Street will be closed, renovating and reopening as a Five Palms. 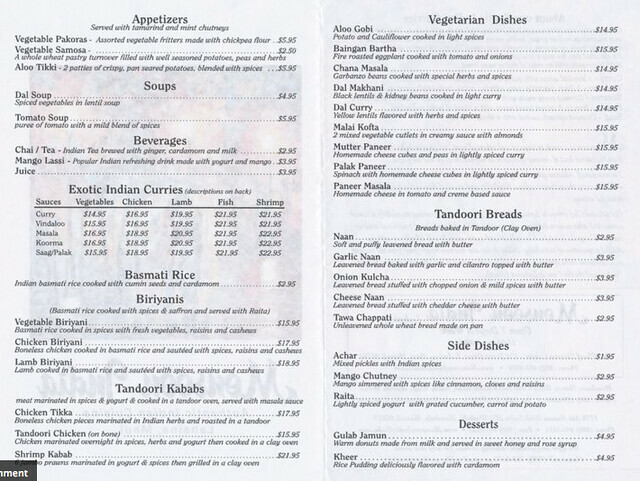 Monsoon India opened in the Wharf bringing their Indian cuisine empire to the West side. According to my local Indian cuisine expert and vegetarian pal Jefferson Wery, food is very tasty. Also at the Wharf, Da Kitchen has a two dinner special for $22 with a choice of 10 entrees, with rice and mac salad. Want to brush up on your wine knowledge? Tim Bruns is forming a wine group to meet in Kahana, outdoors, familiarize yourself wines of the world, and eat some pupus in a casual environment. Call Bruns at 669-3866 if interested.